NASA's Kennedy Space Center will pay tribute to the crews of Apollo 1 and space shuttles Challenger and Columbia, as well as other NASA colleagues, during the agency's Day of Remembrance observance on January 29. The general public is invited to a wreath-laying at 9:30 am EST at the Space Mirror Memorial at the Kennedy Space Center Visitor Complex. Kennedy Center Director and former astronaut Bob Cabana will take part in the ceremony. The Kennedy Space Center Visitor Complex will provide flowers for visitors throughout the day to place at the memorial. 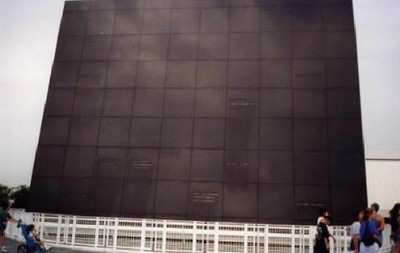 Kennedy contractors and civil servants will be allowed access to the Space Mirror Memorial throughout the day to pay their respects. The Astronauts Memorial Foundation, a private, not-for-profit organization, built and maintains the Space Mirror Memorial. It was dedicated in 1991 to honor all astronauts who lost their lives on missions, or during training, and since has been designated a National Memorial by Congress. This year marks the 42nd anniversary of the Apollo 1 launch pad disaster, the 23rd year since the Challenger explosion, and the sixth anniversary of the loss of the shuttle Columbia... which, in a cruel note of irony, all occurred within five calendar days of each other.